LOS ANGELES- The ALLIANCE for a JUST and LASTING PEACE in the PHILIPPINES (AJLPP), ANSWER-LA and GABNET enjoins all freedom-loving activists to join us on Friday, November 21, 2008, 6 PM, to stage a picket and rally in front of the Sheraton Gateway Hotel, 6101 West Century Blvd., Los Angeles, CA 90045, to protest the presence of Philippine President Gloria Macapagal-Arroyo in the US. The AJLPP strongly condemns PGMA’s puppetry that knows no bounds. The AJLPP denounces the genocidal war in Mindanao that has affected more than 611,000 people over the past four months. 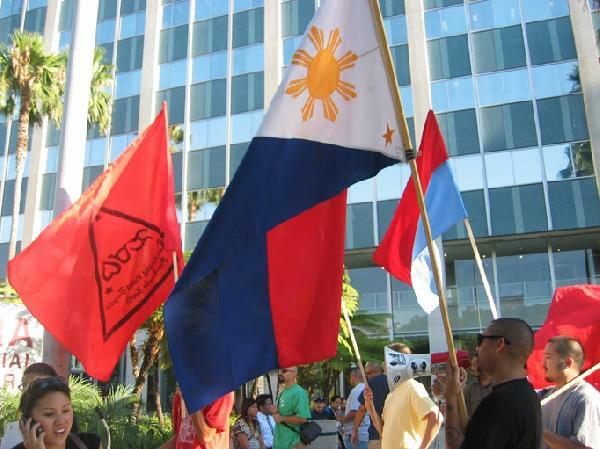 The AJLPP will picket Macapagal-Arroyo's presence in Los Angeles to underscore the fact that the US war on Terror is causing misery and terror in the Philippines with more than 1,200 activists killed, more than 200 people jailed and with more than 200 people declared missing. Last year, Macapagal-Arroyo in anticipation of the passage of the Filipino Veterans Equity bill and in order to grab the credit from real activists in the US, subserviently conferred the Philippines' highest awards to some congressional leaders in expectation of the passing of the Filipino Veterans Equity Bill. It did not pass and the promised benefits were removed from SB 1315. Join us to protest US puppet Gloria Macapagal-Arroyo! BE THERE! BRING SIGNS, NOSIEMAKERS, BANNERS AND STREAMERS!